Natural gas is on the rise. Whereas just a few short years ago, energy companies were investing in terminals to import natural gas, major technological advances have turned a shortfall into a windfall. Domestic output is up and expected to increase over the next 30 years; technically recoverable resources amount to 2,543 trillion cubic feet (tcf), more than a century of supply at current consumption rates. 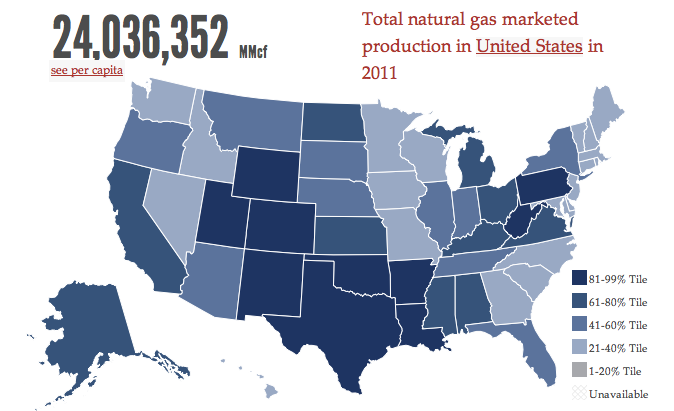 Of the 24 million cubic feet of natural gas consumed in 2011, 95 percent was produced domestically. Production is anticipated to increase 44 percent by 2040 driven almost entirely by dramatic gains in unconventional natural gas production, and set to eclipse consumption. Abundant and reliable, new supplies of natural gas have pushed the market price down, expanding its share in electricity generation, home heating and cooking, and transportation, and helping to bolster the manufacturing and chemicals industry through the recession. Abundance has also made natural gas a popular solution to many challenges facing the United States, including decreasing emissions of greenhouse gases and criteria pollutants, growing the economy, reducing the vulnerability of the American energy economy, and correcting the international trade imbalance in fossil fuels. America’s newfound wealth of natural gas is so dramatically changing our landscape that it even inspired a 2012 Hollywood film. We’re not just seeing growth in natural gas supply, we’re seeing an economic boom. Energy consultants IHS CERA predict that unconventional natural gas alone will be responsible for over 2.1 million direct, indirect, and induced jobs by 2035, up from 900,000 in 2012. By and large, jobs in natural gas are high paying, stable, and skilled. Growth in the natural gas sector will contribute an additional $287 billion annually to the economy, particularly focused around centers of production or their supply chains. Job growth, increased economic activity, and new production will also increase government receipts; all unconventional activity will bring in more than $2.5 trillion in government revenue between 2012 and 2035. These figures do not account for expanded opportunities in the manufacturing and chemicals sectors, which have been taking care of low natural gas prices to launch a significant domestic revival. Low prices also benefit residential consumers, whose low utility and electricity prices afford them more disposable income. The natural gas industry has monumental upside potential as we’re still struggling to resurrect the national economy. By promoting development of this resource, we can generate economic stimulus while simultaneously increasing revenue to the government. How did natural gas become such a game-changing commodity so quickly? Though natural gas was first extracted from a shale formation in the 1820s, it was not until 2005 that the U.S. started producing it in commercial quantities. Through a combination of technological advancements and a buoying price point, shale gas became an abundant, profitable resource. The history of unconventional gas is a particularly telling instance of positive government intervention in the development of energy technologies. Spurred by a disturbing energy outlook in the 1970s, the federal government took up the challenge of exploiting fossil resources economically and assuring an abundant supply. These programs, and the private organizations that built partnerships with the government, are the reason that natural gas is making such a dramatic move. The road to shale exploitation began in 1977 when President Carter told the American public we were running out of natural gas. Production had begun to decline in the mid ‘70s, and prices responded with unprecedented year-over-year increases. Americans were suddenly worried about a fuel that they had been integrating into daily use for electricity generation, manufacturing, and home heating and cooking over the prior generation. At the same time, the Arab Oil Embargo had caused oil prices to quadruple and supplies to tighten. In response, the U.S. government started prioritizing energy research & development – particularly to support fossil energy security. As it turned out, the United States wasn’t running out of natural gas, we had yet to develop the technologies needed to reach it; massive deposits lay in shale, a fine-grained sedimentary rock characterized by distinctly low permeability. The Eastern Shales Gas Project was launched in 1976 by the Morgantown Energy Research Center (now the National Energy Technology Laboratory) and the Bureau of Mines with the intention of leveraging public-private partnerships to develop shale gas in the Devonian and Marcellus shales of Pennsylvania and West Virginia. In 1979, the new Department of Energy created the Commercialization Plan for Recovery of Natural Gas from Unconventional Sources, which united the National Labs, federal engineers, and the private sector to drive unconventional gas resources to market. It is important to keep in mind that the energy crises of the 1970s prompted unprecedented government involvement in setting energy priorities. At the same time that oil and electricity were rationed, the environmental movement was gaining a broad national following. The security of our national energy supply took on a different look. It wasn’t enough that energy be abundant and cheap, two significant challenges during the 1970s, but it should also be clean. This concern spawned large, multifaceted government programs. With few exceptions, these programs leveraged existing expertise in the private sector to push evolutionary advances in extraction technologies and methods, and to bridge gaps in understanding between different corners of the energy sector. Such close involvement with industry toward identified goals kept government research questions novel and up-to-date, and ensured that any breakthroughs in research were published in literature and broadly available to even the smallest energy companies. The non-proprietary nature of research breakthroughs associated with government energy programs at the time created an “open platform” approach to energy problems and solutions. Government would help connect the dots across areas of expertise; private companies would benefit down the road when their technologies came on-line or their wells started producing, but they could not restrict access to or use of advances made under the auspices of the government programs. Program engineers developed directional drilling techniques that would allow developers to tap the deep, tight deposits holding natural gas. This innovation would eventually lead to horizontal drilling, a critical step to economically developing the resources. A second innovation came when a partnership between General Electric and the Research and Development Administration, a precursor to the Department of Energy, developed diamond-studded drill bits that were more effective than conventional drill bits for getting through the deep layers of abrasive rock to reach shale reserves. The project with GE was designed to promote geothermal power, a source the U.S. had started harnessing only in 1960. With electricity prices high, the government also leveraged programs like this one to create power from renewables – free fuel in the midst of high oil and gas prices. Combining directional drilling and diamond drill bits, developers could now reach shale gas deposits; the next step was to properly identify them. Sandia National Laboratories developed three-dimensional microseismic imaging, originally intended for use in coal mining. This new tool, the product of advances in computing power and data handling, allowed developers to see shale formations in heightened detail, identifying natural fractures and the distribution of gas deposits in a formation. Drillers knew where to go to find resources. In 1986, the first successful multi-stage horizontal fracture was achieved by a public-private joint venture in the Devonian shale. This method relied on hydraulic fracturing, previously used to stimulate hard-rock oil deposits, and applied to sandstone formations for natural gas development only in 1977. “Fracking,” as it is popularly known, involves injecting large volumes of liquid under high pressure into a formation, inducing small fissures in the rock that allow natural gas to easily escape. Finally, Congress supported unconventional gas production by passing into law a production tax credit in 1980. At the time, natural gas fetched a wellhead price of $1.59 per thousand cubic feet; the $0.50 credit was a dramatic support for the emerging industry. This credit expired in 2002, once commercial shale gas production had matured. With abundant government support, the private sector needed a champion to pull it all together. That champion was George Mitchell, the father of shale gas and founder of Mitchell Energy, which achieved the first commercial extraction of shale gas from the Barnett formation in Texas in 1998. Mitchell Energy had spent the ‘80s and ‘90s scaling hydraulic fracturing to commercial shale development and experimenting with fracking fluids to yield large quantities of gas. The missing link came through coordination between Mitchell Energy and Union Pacific Resources, an exploration and production company also involved in government shale gas research: slick water fracturing. Using a unique combination of water, sand, and chemical lubricants, slick water fracturing brought development costs down dramatically and yielded more natural gas than previous methods. Through this process, DOE supported Mitchell, covering the higher costs of drilling horizontal wells, creating high-resolution images of the shale, connecting Mitchell with the best hydraulic fracturing technologies, providing fracture mapping software allowing on-the-ground adjustments, and with a generous production tax credit. Government participation in fracking did not end with the successful commercialization of the resource. Developers continue to face the challenge of producing natural gas from shale formations at minimal cost and with minimal environmental impact, particularly with heightened focus on the climate impacts of energy development. Public-private partnerships remain the heart of collaboration to improve the development of natural gas. The Department of Energy helps support the Hydraulic Fracturing Chemical Registry, a site that supports the voluntary reporting of additives used in fracking fluid. There is a limited risk that fracking fluid may contaminate the surrounding environment; to support preparation, discovery, and response efforts, industry has begun to identify chemical additives on this site. Many states now require developers to report through this site or similar routes to keep the information in a clear, centralized database. The Environmental Protection Agency supports the Natural Gas STAR Program, which connects partner companies with one another to discover best practices for reducing the incidental emission of methane associated with natural gas development. Methane is the primary component of natural gas, and is itself a potent greenhouse gas. Gas STAR has been helping companies identify appropriate technologies to put more of the methane resource on the market and less in the atmosphere. Finally, the Department of Energy continues to support research enterprises designed to diminish the impact of shale gas development on the environment. Major goals include reducing the volume of water necessary to frack a well, identifying appropriate treatment pathways for potentially contaminated flowback water, minimizing the footprint of drilling operations and their impact on the surrounding environment and community, and perfecting the protective casements that isolate the well from ground and surface water resources. 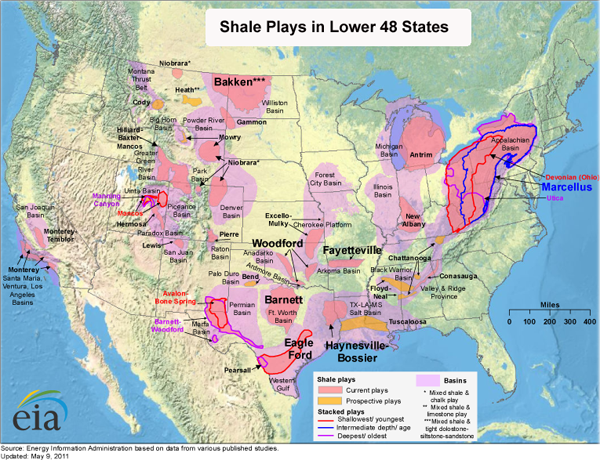 The history of government involvement in the development of shale natural gas resources has been used to justify substantial government involvement in other forms of energy technology prioritized by industry or elected officials. It’s important to keep in mind that the success of the process we now refer to as ‘fracking’ was substantially aided by advancements in non-proprietary applied research and a driven private company willing to take on significant risk to find the keys to development. The government has a clearly defined role in assisting in the basic research required to see major energy breakthroughs – like the directional drilling and microseismic imaging that opened the door to shale gas – but its role in promoting commercialization is unclear. That we can expend federal dollars to help private industry successfully market particular, proprietary energy solutions, doesn’t mean we should. The debate over government involvement in energy investments is much bigger than one success story, particularly considering the alarming security implications of the domestic energy economy in the 1970s. We can already see the impacts of fracking impact the domestic energy landscape. A series of maps produced by the American Action Forum, which track energy production and consumption over the past fourteen years, reflect that natural gas output began its recent climb in 2005. Growth is particularly obvious in Texas, where Mitchell Energy first successfully produced natural gas from a commercial well in the Barnett Shale. Since 2008, output has increased in other major shale deposits, with particularly dramatic production curves visible from production in the Marcellus shale in Pennsylvania, and the Haynesville shale in East Texas and Louisiana. Fracking is also expanding gas production in states like Arkansas, North Dakota, Oklahoma, though those curves are a little behind. Some states haven’t fully started realizing their unconventional gas resources yet, and are poised for growth – Colorado and Wyoming in particular. This natural gas is making substantial impacts on the market, consuming an ever-larger share of generation capacity, notably in formerly coal-heavy states. 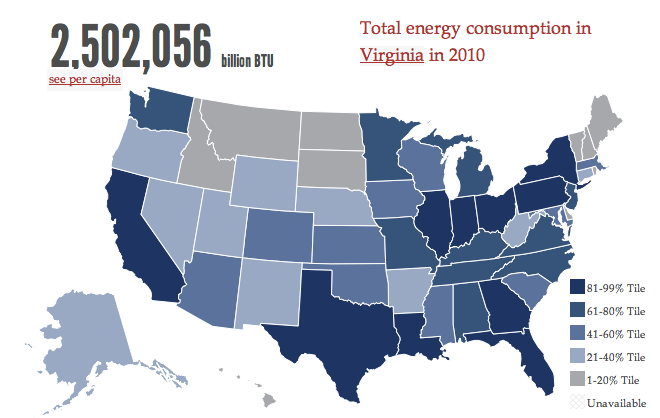 The switch is particularly evident in Virginia, Tennessee, and Minnesota, dramatically slowing coal use in-state and pushing down coal production across the country. Though the trends are obvious in individual states, this phenomenon is happening nationwide. Low natural gas prices, growing government regulatory burdens, and anticipation that greenhouse gas emissions will be regulated all favor the switch to natural gas, particularly in eastern states with considerable existing natural gas distribution infrastructure. Large coal-fired facilities have by and large installed necessary equipment to increase efficiency and reduce emissions, but those costs are not justified for smaller facilities increasingly coming under scrutiny by federal and state regulators. In the case of smaller facilities, operators tend toward idling them, or making the switch to natural gas. The success of fracking has also opened up a debate about natural gas exports. For export, natural gas is cooled and put under pressure to create Liquefied Natural Gas (LNG), which can be loaded on specialized tankers and shipped to markets overseas. In order to export to countries with which the U.S. does not have free trade agreements, projects must receive the approval of DOE. By and large, private industry is supportive of exports. Prices for natural gas are set on regional markets, and many of those markets have considerably higher spot prices than the North American market. Exporting gas can help correct the significant trade imbalance we’ve accumulated in fossil fuels over the past several generations. Major gas consumers, particularly manufactures and chemical companies, want to keep the natural gas resource domestic, boosting their own profits off a supply glut and extremely low prices. Environmentalists, too, want to limit exports, uneager to see increased output of a fossil fuel that is already crowding out growth in renewable energy. A 2012 report prepared by NERA Economic Consulting to help DOE make this decision found that exporting natural gas would create economic benefits for the United States that would not arise in the absence of LNG exports. Despite the report finding greater economic benefit for higher levels of export, DOE will only approve export terminals on a case-by-case basis; one export terminal has been approved and 19 more are under consideration. Exports to countries with free trade agreements are approved automatically, and have been granted to 19 planned facilities. Natural gas is an important part of the budding energy renaissance in the United States. Propelled by recent leaps in technology, developers are turning vast resources of shale gas into marketable commodities that are creating jobs, pushing the revitalization of the manufacturing sector, growing the economy, bringing in government revenues, and, if we play our cards right, helping to correct a dramatic historically destabilizing energy trade imbalance. This new abundance in gas is a direct result of a concerted, long-term research initiative led by federal researchers, national labs, and private companies devoted to launching a new industry. The fracking success story indicates that not all leaps in energy development come from an expected source, and that government can help a industry build in-house expertise and connect resources across a diverse sector. We can expect the industry to continue to collaborate, particularly on improvements that will decrease development costs and diminish the potential for environmental impacts. 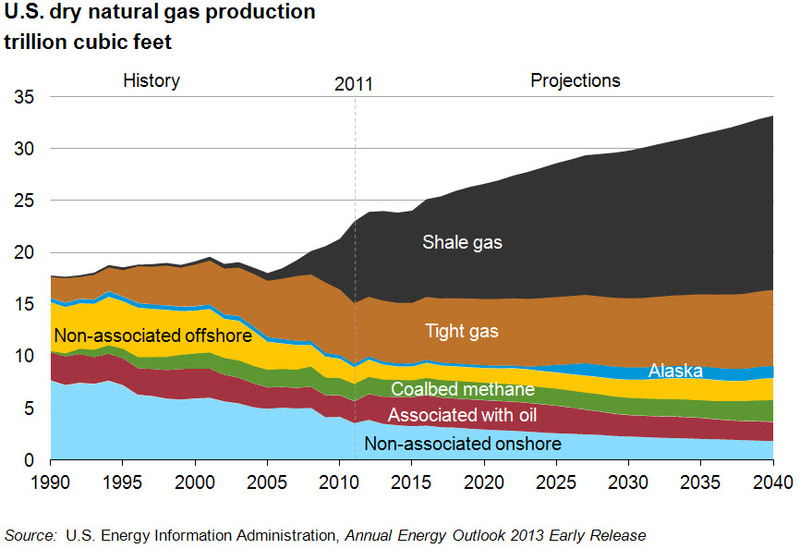 Barring unforeseen events, natural gas is poised to grow and to keep growing for the next generation and beyond. We can already identify positive trends associated with increased development on the state level, like in Pennsylvania, whose natural gas-related employment is expected to more than triple by 2035. Energy maps built by the American Action Forum will help track anticipated changes in production and predict new economic benefits from natural gas development.